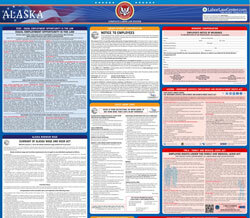 The Emergency Information is a miscellaneous law poster by the Alaska Department Of Labor and Workforce Development. This is a mandatory posting for all employers in Alaska, and businesses who fail to comply may be subject to fines or sanctions. This poster is optional to post and describes what information is needed in case an emergency happens. The poster also has information on who to contact should a fatality or injury resulting in hospitalization occurs. It appears you don't have a PDF plugin for this browser. Please see the link below to download alaska-emerginfo.pdf.